Dual Offshore Rig 42, respec- tively. Each of the units has the prin- cipal dimensions of 180 feet in length, 175 feet in breadth, and 25 feet in hull depth, with a leg length of 416 feet 8 inches. The rigs each have accommodations for 92 men. The jackup drilling rigs are designed to drill to 20,000 feet at a water depth of 250 feet, and withstand winds up to 100 knots and wave heights of 57 feet. Korean shipyard. The first rig was delivered recently and the second is scheduled for delivery this month. The jackup Dual Offshore Rig 38 is one of two being built by Daewoo Shipyard. ARCO Indonesia under a lease contract, according to R.T. Prid- dy, chairman of Dual Drilling Co.
Korean shipbuilders are now constructing 10 percent of the rigs presently on the world or- derbook. The weak piling above severely threatened a dock operation. After receiving the SeaForm treatment, this piling is stronger than ever. SeaForms resist common corrosion to add years to the life of your dock, bridge, terminal or pier. And they work equally well on steel, wood or concrete piling. Don't let your dock operation go under, call us We'll do the whole job from underwater inspection to final installation. Aquatic Marine Systems Inc. 16,620 BUYERS IN FOUR DAYS? Impossible you say. 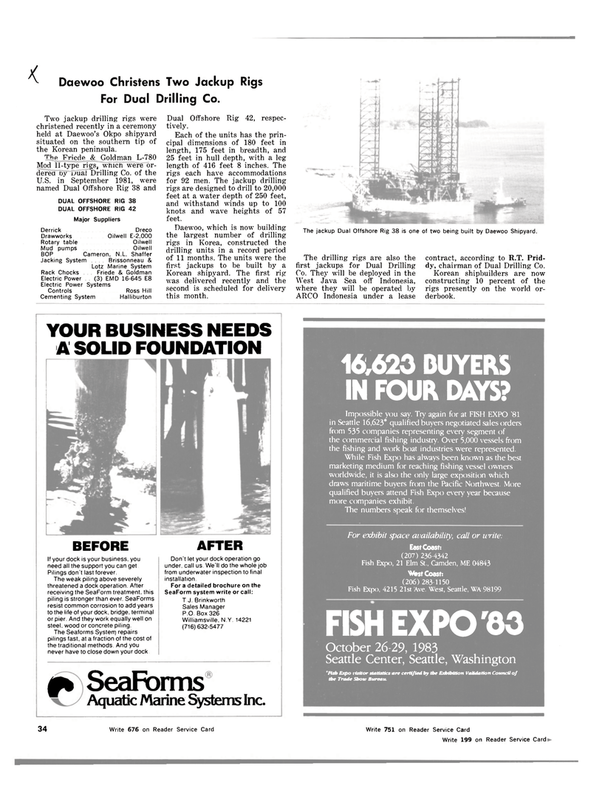 Try again for at FISH EXPO '81 in Seattle 16,623* qualified buyers negotiated sales orders from 535 companies representing every segment of the commercial fishing industry. Over 5,000 vessels from the fishing and work boat industries were represented. While Fish Expo has always been known as the best marketing medium for reaching fishing vessel owners worldwide, it is also the only large exposition which draws maritime buyers from the Pacific Northwest. More qualified buyers attend Fish Expo every year because more companies exhibit. For exhibit space availability, call or urite.